Healthcare biotechnology serves a pivotal role in the realization of the National Biotechnology Policy (NBP) devised in 2005. The abundance of natural resources found within our borders will serve to drive biotechnology as a new economic engine in the near future. Following a decision by the Cabinet on the implementation of the NBP (Memorandum MOSTI No. 882/2534/2006), the Malaysian Institute of Pharmaceuticals and Nutraceuticals (IPharm) was established on 29th November 2006 under the Ministry of Science, Technology and Innovation in order to spearhead this initiative by delivering world-class R&D to accelerate the discovery, development and commercialization of pharmaceutical and nutraceutical products. Tun Dato' Sri Haji Abdullah bin Haji Ahmad during BioMalaysia Conference on 28 April 2005 at Putrajaya International Conference Centre. This policy, endorsed by the Malaysian Cabinet on 20 April 2015 emphasises on the development of three core areas of biotechnology, namely the agriculture, healthcare and industry. Under NBP's Healthcare Biotechnology thrust, the government aspire to get benefit from country's enviable wealth in natural resources especially in drug discovery and development. Concurrently, the potential of bio-generics market is also recognized as an important area in healthcare biotechnology. Realizing the challenges in developing the healthcare biotechnology is competitive, the Cabinet endorsed the proposal to establish a centre of excellence. This historical decision marks the birth of the Malaysian Institute of Pharmaceuticals and Nutraceuticals (IPharm). 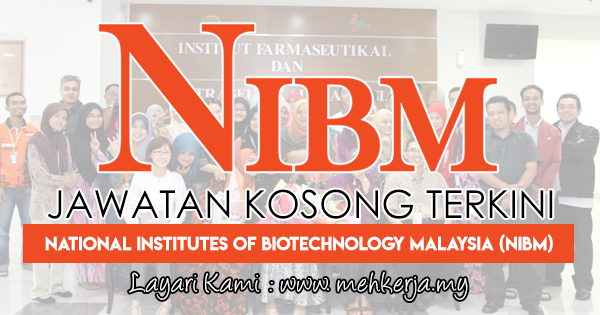 0 Response to "Jawatan Kosong Terkini di National Institutes of Biotechnology Malaysia (NIBM) - 11 April 2018"